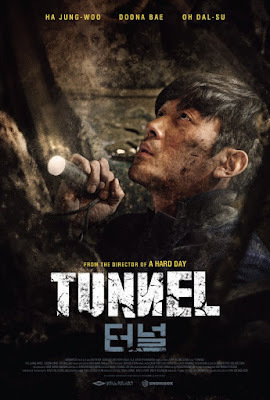 The Tunnel is a film by South Korean director Seong-hoon Kim and tells the story of a man trapped underneath a collapsed highway tunnel along with the efforts of the rescue team tasked with getting him out. The movie features acting performances by Jung-woo Ha, Dal-su Oh, and Doona Bae. 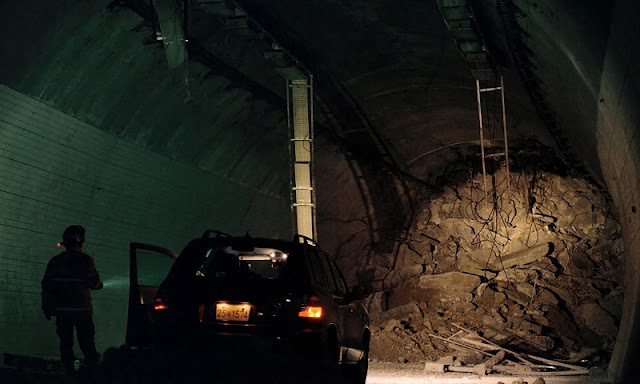 You ever drive into a tunnel and think to yourself what might happen if the tunnel suddenly and completely collapsed leaving you trapped under a mountain of debris? This movie looks to show exactly how that might go down while also providing a commentary on how the ensuing rescue attempt would be affected by politics, media, business, weather, and human emotion. Soeng-hoon Kim manages to mix all of these things in to his film while still keeping the focus on a very well thought out and intimate story about a man's struggle to survive with the world literally crashing down upon him. Jung-woo Ha plays Jung-soo Lee, an automotive company employee and loving family man who finds himself in this most unfortunate of circumstances during his drive home to his daughter's birthday party. Alongside this starring role we get outstanding performances from Doona Bae as Lee's wife and Dal-su Oh as the man in charge of the rescue operation. All three performances are very well thought out and provide the core of emotion that drives the narrative through to its inevitable conclusion. At first, I thought Doona Bae's character might just be a side note just to have a wife to care about but she really comes through with a very strong performance that, in a lot of ways, is the backbone of the entire story. 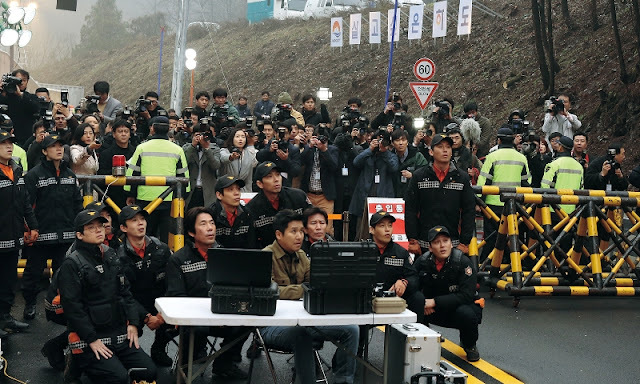 While the story is as intense and dramatic as you might expect, there is also a fair amount of humor mixed in which I was glad to see since it is one of the things I really enjoyed about watching Seong-hoon Kim's A Hard Day. His ability to add humor to otherwise difficult situations really helps to create and enjoyable experience. Of course, a movie like this isn't going to be all fun and games and, in the third act, things definitely go down a more dire and somber path. Unfortunately, this is also where the story comes to a screeching halt and, if not for an emotionally charged finale, might have been completely derailed. It's not that it was really bad in any way, the story just lost all momentum and I really started to feel like maybe the two hour and six minute run time might be a bit long. The ending also felt a bit rushed although still effective so maybe a little more focus in the editing room would have made this a more complete film. 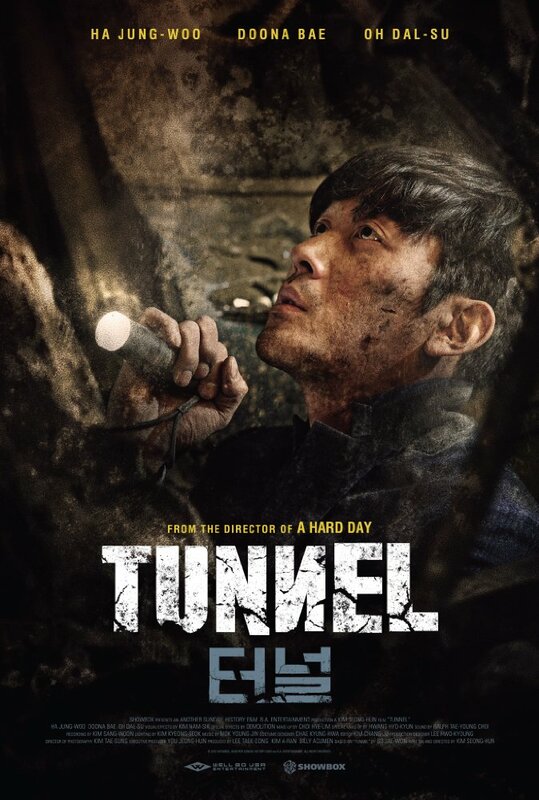 The Tunnel is a fun, entertaining, and emotionally charged film filled with social commentary and a powerful message about the human spirit and our will to survive against incredible odds. The movie is not without its flaws but is at its best when showing how effective we can be when our decision making focuses on taking action and how we depend on each other for support to get through tough times.